WHAT IF YOU ARE WRONG; WHAT IF ALL CHRISTIANS DON’T GO IN THE RAPTURE? There is a lot of talk lately about the ‘Rapture’. Everywhere I turn people are talking about the signs of the end times. The signs are literally screaming at us, and yet I regularly encounter Christians who have zero interest in discussing the possibility that Christ’s Second Coming may be in our lifetime. I’m talking about Christians who will not even consider the signs pointed out in scripture. Two examples come to mind. I’ll call one the ‘pan-millennialist’ and the other the ‘scoffer’. The first will, if the subject is broached, say, “I’m a pan-millennialist,” (ha, ha, ha; slap on the back) “I figure it will all pan out in the end; know what I mean?” The other, the Bible calls a ‘scoffer’ because 2 Peter 3:3,4 tell us that in the last days scoffers will come, saying “where is this ‘coming’ he promised? Ever since our fathers died, everything goes on as it has since the beginning of creation.” (v.4) Although scripture promises blessings for those who study and read Revelation, neither of these has any desire to study prophetic scripture. Let me point out regarding ‘The Rapture/Second Coming’ that it is obviously God’s will that we live in expectation of His imminent return. We are to be preparing for His return. Luke 21:36 says, “Be always on the watch, and pray that you may be able to escape all that is about to happen, and that you may be able to stand before the Son of Man.” I take that to mean that some, not all, will escape the coming judgment upon the Earth. He, Jesus, in Luke 21 is speaking to His followers about the end times. These described above believe that there is ‘no gain’ in watching and getting ready for His return. They assume and have been taught in church that whenever the rapture occurs, they will go, because, after all, they’re saved! The Rapture is for the whole Church, Right? What if they are wrong? What if there is the possibility of those not watching, of those not ready, being left behind? I believe there is scriptural evidence for this. I have even changed my terminology and now speak of ‘The Rapture of the Bride’ not ‘the rapture of the church’. True enough, the Bride is a part of the Church but not the whole church. Scripture tells us that Jesus is coming to get His Bride who is purifying herself, making herself ready, and eagerly awaiting the coming of the Groom. Does that describe you? What Bride does not eagerly anticipate her wedding day? Nominal Christians, ‘pan-millennialists’, scoffers do not fit that picture. Pan-millennialist just want ‘a cabin in the corner of gloryland’. No need to get all consumed with this spiritual journey, after all, I’ve got my pass stamped. They’re certainly not eagerly awaiting His return; why given the choice, they may even choose to stay behind; opting to catch up with the Lord on His next pass in seven years. Many say this parable is not about the rapture but it certainly is about the groom coming for His bride to take her to the Fathers’ house for the wedding. Sounds like the rapture to me! The phraseology, “no one knows the day or the hour” certainly speaks of the rapture because at His Second Coming to Earth, the exact day will be known. It will be, according to scripture, 1260 days or 3 ½ years after the abomination of desolation in the temple in Jerusalem. This is precisely why the Anti-Christ gathers the armies of the world to stop Jesus from returning to reign as King of King and Lord of Lords. They know the day according to prophetic scripture. The parable parallels a Jewish wedding feast of that day. This also parallels what we call the rapture! In the Jewish tradition, once the proposal of marriage is accepted, the groom goes to prepare a place for the couple to live. (John 14:1-4) When the Father of the groom is satisfied with the arrangements and preparations, he tells the groom, ‘go and get your bride’. It’s a celebratory atmosphere but the groom keeps the exact time a secret from the bride and wedding party. As the groom gets close to the brides’ house the best man shouts, “Behold, The bridegroom cometh!” The groom snatches his bride; the wedding party is assembled and they go to the Fathers’ house for the ceremony and celebration which lasts seven days. In NT prophecy, when the Bride is taken, that marks the end of ‘the church age’. Daniel 9 tells us that the history of Israel is divided into 70 weeks of years. We find that 69 weeks of Jewish history have past, (concluded when Messiah was cut off). Then the age of Grace, like a parenthesis is inserted. Israel awaits her final week of history. According to scripture that 70th week will begin when Israel makes a seven year peace treaty with the anti-Christ. 2 Thess. 2:7 states that the Anti-Christ cannot be revealed until ‘HE who restrains’ is taken out of the way. It is generally agreed that ‘He who restrains’ is the Holy Spirit. It is also agreed that ‘He who will never leave us nor forsake us’ leaves when the Bride leaves, ie. ‘the rapture’. So, while a week of years, Daniels’ 70th week, Great Tribulation, occurs on Earth; the week long wedding celebration is taking place in Heaven, the Fathers’ house. Notice in Matthew 25:1-13 they all slept; they all were invited to be a part of the wedding feast. Five went and five were shut out because they were not ready. Let me return to Luke 21:36. “Be always on the watch, and pray that you may be able to escape all that is about to happen, and that you may be able to stand before the Son of Man.” Note: this is a two-fold admonition. One: that you may be able to escape judgment that is described in Luke 21 by Jesus himself; and Two: that you may be able to stand before the Son of Man. The phrase “to stand before” has two meanings in scripture. One, is to ‘stand in Judgment’ and Two, is for a Bride to ‘stand before her groom’. Since we are specifically speaking here of escaping judgment, then in my opinion, this is the picture of the Bride standing before the groom in marriage as is Jewish tradition (and ours). This is a picture of the Bride being ushered down the aisle to the groom and stands before him. I believe that according to scripture those of the church who are double minded, not making ready, not watching and praying are not a part of the bride. They are saved in the end, but as here are left behind to endure judgment that falls during Great Tribulation. What if I am right? What if the Parable of the Ten Virgins is a separation of those who are longing for His appearing from those who are saved but caught up in the cares of this world? The main body of Revelation has seven eschatological visions. The key to understanding Revelation is to allow each of these visions to stand alone. 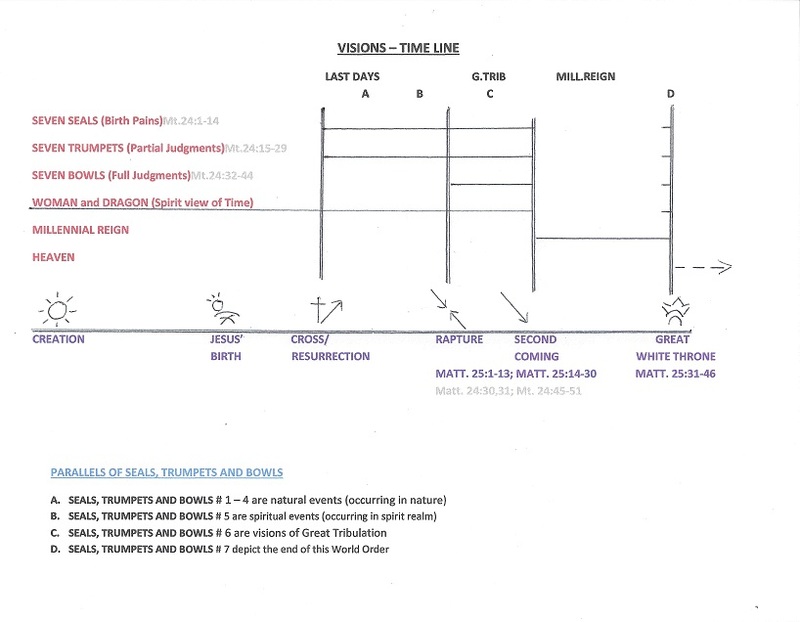 Traditional interpretations provide that all seven visions follow each other in sequence beginning with Chapter 4:1 which is interpreted to be the Rapture. Thus, the entirety of Visions 1 – 5 must fit into a seven year period of time called The Great Tribulation. This sequential approach leaves a lot of confusion. Many give up rather than wade through the symbolism. It was recently pointed out to me that the language of Revelation suggests that one vision is followed by another as John the Apostle says, “after this I saw…” and “then…” Remember John is seeing one vision and ‘then’ another. He is relating to the reader the order in which he sees the visions; he is not necessarily assigning them to a sequential order of events. We do no harm to the veracity of scripture by allowing each of these visions to stand alone. With that being said, it is obvious that the whole pattern is historical beginning with or near God’s creation of this Earth and continuing through to the end of this order and the beginning of the next eternal kingdom. Drop your preconceived ideas and what you’ve heard others say; let’s journey into scripture and try to see the simple interpretation. God as creator/sustainer – Chapter 4. The purpose of chapter four is to show the reader the throne room of creation; and that regardless how bad things get, God is the creator and sustainer of this order. He is on His throne and although Satan appears to be in control of the Earth, God has written the final chapter. God as redeemer – Chapter 5 – shows the adoration of the Lamb slain. Christ, the righteous judge, is our deliverer, so we have hope despite the events about to unfold. Keep in mind that we have observed in the throne room of Heaven, the Lamb – slain. It is He who is worthy to open the seven seals. Also, note (as my wife pointed out through her Revelation study) there is no mention of the church in Heaven in either chapter 4 or 5. The opening of the seven seals begins after the crucifixion; it is Christ Jesus, the Lamb of God – slain, who is opening the seals. Many believe the seven seals are opened after the rapture of the church, and they point to Rev.4:1 as that event. However, because of the teachings of Jesus in Matthew 24, I believe that the first four of the seven seals typify the entire period of time, in which we live, that runs from the cross-resurrection event until the end of this age. Compare with Matthew 24:1-9. The entire period of time correctly called ‘the last days’ is typified by 1.False Messiahs, 2.Wars and rumors of Wars, 3.Famine and Pestilence, 4.Persecution and Death. This has been the nature of the world for 2000 years. These four events are synonymous with the first four seals, also known as ‘The Four Horsemen of the Apocalypse’ found in Rev. 6:1-8. As stated in Matthew 24:8; “All these are the beginning of birth pains.” This simply means that these signs will grow in intensity and frequency until the end comes, or until the church is delivered. My own view, and that of Dr. Douglas Ezell, Revelations on Revelation, New Sounds From Old Symbols, is that the Seven Seals typify life on Earth but more specifically what those who are in Christ Jesus will experience. False Christ’s, War, Pestilence and Death follow life on Earth for all, but when the 5th seal is opened, we are in the throne room of Heaven where we see the martyrs of this whole period. In this view we are not shown what is happening on Earth, because the seals typify the followers of the Lamb and the Bride is absent from the Earth during this time which corresponds with the “First Woe” or Trumpet #5. Partial judgment against ungodliness does not apply to the followers of the lamb, therefore, no correlation between Seal 5 and Trumpet 5 other than both are spiritual views of the end time. Seal 6 and Trumpet 6 both depict Great Tribulation, and parallel the Bowls of Wrath giving us a different perspective of the same time period. Chapter 7 shows those who are redeemed during tribulation, (still part of Seal #6). Notice in chapter 7:15 the language is present tense, not future. They are, “…before the throne of God and serve him day and night in his temple; and he who sits on the throne will spread his tent over them. Never again will they hunger; never again will they thirst. …and God will wipe away every tear from their eyes.” We know this actually happens following the 1000 year reign of Christ upon the Earth, but here it is in Chapter 7 prior to the Seventh Seal. The Seventh Seal is opened and there is ‘silence in Heaven’. This silence represents “The End!” This is not silence in Heaven because the Trumpets are about to sound. “I am not… claiming that the Apocrypha is sacred script. I am trying to show that a first century interpretation of the end posited a belief that there was to be a silence before the new creation to correspond with the silence before the first creation.” -Dr. Douglas Ezell, Revelations on Revelation, New Sounds From Old Symbols. Chapter 8 verse 2 begins a new vision that parallels the seven seals, in time. Here in the first four trumpets you have partial judgments cast upon the Earth because of wickedness and unbelief. Whereas the Seven Seals give us a vision of the followers of the Lamb of God during the entire period of time from the Crucifixion / Resurrection event until the end of this order, so the Seven Trumpets give another vision of the partial judgments that will be unleashed because of the followers of Satan. I say partial because, you see the pattern of 1/3 Earth burned, 1/3 sea becomes blood, 1/3 fresh waters polluted, 1/3 heavens struck and darkened. The first four Trumpets, as the first four seals, are physical/natural events. Trumpet #5 brings torment against men who do not have the mark of God on their foreheads. This is ‘the first Woe’. This is partial judgment targeting those who are not followers of the Lamb. These judgments may be natural consequences of ungodly lifestyles, but it is a time of misery, agony and demonic oppression for those who do not have the seal of God in their foreheads. I think we have to admit that just as Christian martyrdom has typified the whole ‘end time’ so partial judgment against ungodliness also must typify the entire end time. Seal and Trumpet #5 give us a spiritual view of the entire end-time. Trumpet #6, in my opinion, gives another view of judgment (Great Tribulation) and here, death to men, ‘the Second Woe’. The 7th Trumpet, ‘the third Woe’, is ‘The End’, representing ‘final victory’ for God, or The Great White Throne of Judgment where Eternal Reward or Eternal Punishment is meted; a joy to followers of the Lamb; final judgment for unbelievers. Look at the language. Rev. 11:15, “The seventh angel sounded his trumpet, and there were loud voices in heaven, which said, ‘The kingdom of the world has become the kingdom of our Lord and of his Christ, and he will reign forever and ever.” Verse 17, “…you have taken your great power and have begun to reign.”(present tense) Verse 18, “…the time has come for judging the dead and rewarding your servants, the prophets and your saints and those who reverence your name.” This is a picture of ‘the end’. Shall we say, ‘the end’ of this order and ‘the beginning’ of the eternal order, for all believers. Chapters 12-14 is a spiritualized vision of ‘TIME’. It begins at or near creation and runs until ‘TIME’ is no more. Timeline: Satan was cast out of Heaven with his angels before or shortly after creation, not midway through Great Tribulation. Satan was given title deed to the Earth by Adam in the Garden of Eden. Satan and his demons control the Earth and the atmosphere surrounding Earth, as well as the underworld. Daniel 10:12; Daniel’s prayer was heard on the first day of the three-week period, but the answer was delayed because of angelic warfare . Matthew 4:8; Satan told Jesus that He could have all the kingdoms of the Earth if He would worship Satan. Jesus didn’t contest Satan’s authority to give it. My opinion: The woman (Israel) was protected by a great Eagle, (USA) out of the reach of the serpent. The serpent spewed water like a river to overtake the woman. (Holocaust) but the earth helped the woman (WWII). This enraged the Dragon and he proceeded to make war against the offspring of the woman, (Christians) “…who obey God’s commandments and hold to the testimony of Jesus.” I do believe that we can agree that since WWII Christians have come under heavy assault of Satan. Chapter 13 has to do with the Beast and his False Prophet. This introduces the unholy trinity. In the previous chapter, the Dragon is Satan. This is the Anti-Christ and the False Prophet. The Anti-Christ is ‘the man of lawlessness’, the political ruler who sets himself up as God. The False Prophet is his enabler. He is the leader of the ‘one-world religion’. He introduces the ‘mark of the beast’, (666) thought to be the cashless society. This is another view on Earth during ‘Great Tribulation’. Chapter 14 takes us back to Heaven and Final Judgment on Earth. We see the 144,000 who have been redeemed through Great Tribulation. (Compare this with Revelation Chapter 7) The angel who has carried the eternal gospel proclaims that the hour of God’s judgment has come. A second angel proclaims that Babylon the Great has fallen. A third angel proclaims that anyone who worships the beast and/or receives his mark (666) is damned. Chapter 14:14-19 speaks specifically of the ‘harvesting of the Earth’. The language of verses 14-16 speaks of the rapture which immediately precedes judgment. The sealing of the saints in chapter 7, the measuring of the temple in chapter 11, and the harvest of the Earth in chapter 14 all may speak of the ‘rapture’. If this is the case, these events must align? There is only one rapture! (There are two additional resurrections)Verses 17-19 speak of final judgment when the grapes are thrown into the winepress of God’s wrath. The closing language sounds like the language of the final battle of Armageddon where the blood rises to the horses’ bridles for 1600 stadia. (180 miles) From this portion of the vision you can understand how some arrive at the pre-wrath rapture conclusion that the rapture immediately precedes Armageddon. However, we can find throughout scripture where we are given order of events without the determining time verification. For example: Malachi 3:1 speaks of the Messiah’s first appearance, including John The Baptist. The very next verse (verse 2) speaks of Messiah’s second coming; at least two thousand years between verses 1 and 2; so here, in chapter 14, we know that rapture precedes judgment. We don’t know the period of time between the rapture and judgment from this passage. Another indication in scripture of a long passage of time is seen in Luke 21:24. In this one verse we see another prophecy where 1897 years pass between the first and second sentences of this verse. Speaking of the Jewish Dispersion verse 24 declares, “they… will be taken as prisoners to all the nations.” (this began in AD 70 when Jerusalem and the Temple was destroyed by the Roman General Titus. A later Jewish uprising in AD 133 – 135 completed the dispersion of the Jews into the nations. Jerusalem was turned into a pagan city called Aelia Capitolina and Jews were forbidden to live there.) “Jerusalem will be trampled on by the Gentiles until the times of the Gentiles are fulfilled.” (Jerusalem returned to Jewish control in 1967; made the capital of Israel in 1980) From the dispersion to the return to Jerusalem was 1897 years. The visions of the seven bowls begin after the rapture or the harvesting of the Earth. This is commonly called ‘Great Tribulation’. Verses 1-4 indicate that those who persevered are beside the glass sea in Heaven. Now begins the full judgment upon the Earth. Whereas the Trumpets had represented partial judgments upon the Earth, Sea, rivers and heavens, so the ‘bowls of wrath – poured out’ represent full judgment upon the earth, the sea, the rivers, and the heavens, all affecting men, all temporal or physical in nature. The 5th Bowl, similar to the 5th Trumpet represents Spiritual Judgment on the Kingdom of the Beast. In my opinion, the 6th Seal, the 6th Trumpet and the 6th Bowl all represent the battle campaigns of Armageddon, culminating with the final battle as represented by Bowl #6 and War with the Dragon, Rev. 14:17-19. At any rate, The 7th Bowl speaks of the end, as does the 7th Seal and the 7th Trumpet. Chapter 19:11 begins the description of the Vision of the Millennial Reign of Christ. It begins with a description of Christ at His Second Coming. He comes bringing the armies of Heaven. He is coming as a conqueror. He is coming as King of Kings and Lord of Lords to rule and to reign upon the Earth. His weapon is a two-edged sword proceeding from His mouth. Here again is the ‘winepress of God’ mentioned. Armageddon follows. This culmination of the campaign called Armageddon is the official Second Coming of Jesus. The very day will be known beforehand; for this occurs 1290 days following the Abomination of Desolation in the temple where Anti-Christ sets himself up to be God. Because of Scriptural prophecies, the Anti-Christ and the armies of the Earth will proceed to Israel to STOP Christ from returning and setting up His kingdom on Earth. This cannot be the rapture because of the ‘rapture’ no one knows the day and the hour. Only the Father knows, not even the Son. This day will be known and the armies of the Earth will come against Messiah. The Anti-Christ and False Prophet will be cast into the Lake of Fire; the rest of the armies of the world will be killed then and there. Following the thousand years, Satan will be loosed and will immediately begin rebellion against God and the people of God. The world will again gather around Jerusalem to destroy God’s people, but fire will fall from Heaven and devour them; Satan will be cast into the Lake of Fire. The Great White Throne of Judgment follows. (Matt. 25: 31- 46) This is the Second Resurrection and is followed by the Second Death. If anyone was not found written in the Book of Life, he was cast into the Lake of Fire, the Second Death. Death and Hell were also cast into the Lake of Fire. The Holy City, the new Jerusalem comes down from heaven. This signals the beginning of the eternal state where God will dwell with men. This is when God wipes away every tear from their eyes. There is no more death, mourning, crying or pain for the old order has passed away. This will be Earth inhabited with immortals. There will be no night there! God is the light of the new order. Finally, we conclude by again entering the throne room of God, where we can see God’s face, and we will be with Him forever and forever. Words of Comfort, Words of Warning. Q: What Happens to Believers Who are Not Ready? A: It is common knowlege that Matthew 24 and 25 are the techings of Christ on End-Time events in response to questions by His disciples. Often overlooked in End-Time teachings is Matthew 25:1-13. The parable of the Ten Virgins. These are the words of Christ. He tells us that this parable relates to His coming. Some have suggested that this is the division of the saved and lost and those left out were lost. Not so! All were saved! Five were wise; five were foolish. The Ten Virgins represent ALL believers, hence the church. In Matthew 7:23 where Jesus says to those who ministered in His Name, “I never knew you.” The word used, (gunos’ko) means, “I have no knowlege of you.” They were lost! Isn’t this exciting! The Bride of Christ is purifying herself. The Bride of Christ is eagerly awaiting the coming of the Bridegroom. Those in the church who are not being purified, who are not getting ready for the Bridegroom, who are not watching and waiting, not ready for His coming to take them to the wedding feast are saved, but they are not the Bride. THE BRIDEGROOM IS COMING FOR HIS BRIDE! …and she is pure, clothed in white! Many who are saved, but are double minded (foolish), not intimate with the Bridegroom will be left behind to endure Great Tribulation. WILL YOU BE LEFT BEHIND IN THE RAPTURE? YOU BE LEFT BEHIND WHEN THE TRUMPET SOUNDS? The Partial Rapture of The Church! Whoa! What do you mean? a literal rapture will precede the return of Christ. his literal reign upon Earth. Why do I say Partial Rapture? What is that? endure the seven years of the Great Tribulation upon the Earth. took their lamps and went out to meet the bridegroom. 2 “Now five of them were wise, and five were foolish. 4 “but the wise took oil in their vessels with their lamps. 7 “Then all those virgins arose and trimmed their lamps. who were ready went in with him to the wedding; and the door was shut. which the Son of Man is coming. wedding party. So let me suggest – All ten were saved! home proceeds. The Wedding feast last seven days! seven day feast. This is the Rapture! the coming of the Son of Man for His Bride. events, the exact day of Christ’s return to Earth WILL BE KNOWN. to Earth to reign as KING OF KINGS and LORD OF LORDS. there an inconsistency? Not at all! No one knows the day or hour of the Rapture of the Church. teaches us that 69 of these weeks of years have passed and one is yet to come. Jewish history entered a parenthesis some 2000 years ago. week long wedding party in Heaven. His Bride will be left behind to endure the Great Tribulation upon the Earth.